Groningen is the capital city of the Dutch province of the same name. It is mainly known for its great student life, a big part of the population is made up by students, taking place around the big market square called "Grote Markt" and the "Vismarkt". 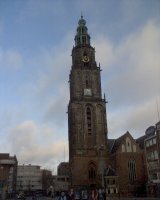 On the Grote Markt you also find the most famous landmark of the Groningen, the Martinitoren. The center is dutch in the way that there are canals. It is the biggest city in the north of the Netherlands and is reached most comfortably by train from Utrecht and Amsterdam in about 2 hours. The 500-year-old Martini Tower is the main landmark in the city. It used to be possible to climb it but this has been suspended after a few suicides took place lately. Although smaller than those in Amsterdam and Utrecht, Groningen has some canals and a one hour boat trip is something you should consider to see the historical buildings from a different perspective. Groningen also has a good share of museums, the Groninger Museum being of the most impressive ones. It is just across the trainstation and the building just can't be missed, with striking architecture by Italian architect Mendini. The main trainstation is worth seeing itself as well by the way, with its 19th century architecture it is one of the most beautiful trainstation in the country. The Museum of National History. In the second weekend on January, there is one of the biggest music conventions of Europe coming to Groningen. The days of the business people are filled with seminars at the Oosterpoort, but on thursday and friday evening there is music in a lot of cafés in the centere of Groningen. If you want to watch a couple of the upcoming European bands before they become big, this is the place to be. On saturday there is Noorderslag an evening at the Oosterpoort with only dutch bands. Tickets for both events are limited. Groningen weather is typical of what you get in the Netherlands: mild winters with rare snow, and reasonably warm summers. Generally though, both summer and winter are just a bit colder compared to places more to the south in the Netherlands, meaning temperatures around 20 °C during the day and around zero during the winter. Groningen is one of the places in the Netherlands that served by Eurolines. Public Express operates a bus from the Groningen trainstation to Bremen Airport. Groningen is not the best city to drive around in with your car. Parkingspaces are limited and prices are pretty high. There is however the option to park your car at a so-called transferium. These are places where you can park your car, and continue to the innercity by public transport. There is one at Kardinge (N46), but also a little bit further away from the city in Haren (south along the A28), Hoogkerk (along the A7) and at Zernike there are transferiums. There are several city buses connecting all neighbourhoods, all of them start at the Central Station. Qbuzz is the main operator for these buses. If you stay in the centre of Groningen, it is easy enough to find your way on foot. As it is not a huge city, this is not a place where you will have blisters on your feet from walking. As in many Dutch towns and cities Groningen is a perfect city for using a bicycle. The only pieces that go uphill are the bridges. A lot of the restaurants can be found in the inner city, and most of them are located at or near the Grote Markt and the Vismarkt. For most travellers the wagamama restaurants are well-known for providing good food for a reasonable price. Groningen has one at the Vismarkt. Just like the restaurants, most bars and cafés can be found around the Grote Markt and the Vismarkt. 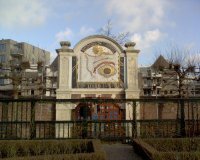 We have a comprehensive list of accommodation in Groningen searchable right here on Travellerspoint. You can use our map to quickly compare budget, mid-range or top of the range accommodation in Groningen and areas nearby. This is version 21. Last edited at 3:01 on Aug 2, 17 by sleepBot. 8 articles link to this page.